Born in Sao Paulo, Brazil, on February 10, 1936, Anne died peacefully at Moog and Friends Hospice House in Penticton on May 30, 2017. 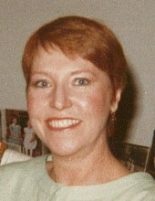 She is survived and sadly missed by her sister, Christine (James); nieces Emma (Paul), Heather (Chris) and Joelle (Mark); and cousins Karen, Ron, and Maureen (Lowell). She is predeceased by her parents, Mary and David Richards. Anne received a degree in Honours Chemistry from UBC in 1959. She moved with her husband Charles to the Eastern US, where she had a long career with Bell Labs, AT & T and GTE. After retiring to Penticton (where she had attended Pen-Hi), Anne became an active volunteer, notably with Critteraid Sanctuary, the Penticton Industrial Development Association and assisting seniors with their computer skills. She will be greatly missed by her many dear friends. The family would like to thank the staff at Regency Southwood and Moog & Friends Hospice for all of their care and compassion.